This coming Christmas' Must-Have Stocking Stuffer for the Republicans on Your List. I SOMETIMES WISH I COULD BE A DEMOCRAT ONCE MORE . It was a good party in its time, it had nice ideals once, and, to tell the truth, I'm not at all easy being labeled as a Republican especially since I'm not. At the same time, I have to admit it is just too embarrassing these days to be a Democrat. It's not so much that they are wrong. Sometimes they are not wrong. It is not so much that so many of them are demented by the very existence of George W. Bush in the same universe. Not all are demented. Chiefly, I think that it is hard for men to be a Democrats these days because the Party has taken on an ever-growing blob of ur-male members who have run up a catastrophical overdraft at The Bank of Testosterone. That wouldn't be so bad in itself, but it seems that a symptom of this syndrome is for the man involved to become, well, moist. Although they are legion, these moist men sometimes rise above sea level and become a sign, a symbol, an avatar for the rest. 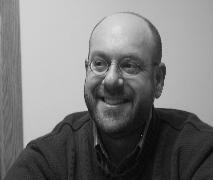 Today's Poster Child for Pap has to be Jeremy Zilber . Zilber's got all the career achievements you need to be the very model of a modern moist Democrat. B.A. from Oberlin, styles himself a "lifelong Democrat and political activist," has written a "scholarly" book whose bias shrieks out in its title ("Racialized Coverage of Congress: The News in Black and White"), lives with his partner and her daughter, and a cat. He's got all the fundamentals down pat. 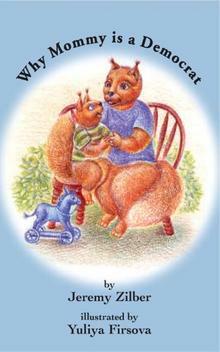 Now comes his crowning achievement, a children's book called ... wait for it.... Why Mommy is a Democrat. "Why ... Mommy ... is ... a ... Democrat..." I used to think there were some limits to the mind's capacity for bogglement. No more. Perhaps you, like me, have had a brief gobsmacked moment when you thought, "Nah... it's gotta be one of these Internet hoax things." Lord knows I did. But if it is, count me in as a believer. 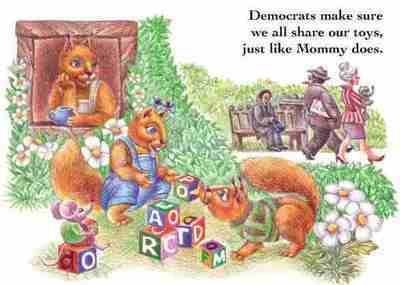 Why Mommy is a Democrat is either one of those realities that just has to be a hoax or one of those hoaxes that just have to be real. One of the nice things about the Internet is you no longer have to make this stuff up, somebody else is always out there making this stuff up before you can think of it. In which we observe the kindly bushy-tailed mommy passing out apples and books while those evil WASP plutocrats in the background block the doors to Yale with a $160,000 price tag. They are white. They smoke cigars. They hold bouquets of expensive cut flowers. They brandish their diplomas. They must be.... gasp!... Republicans! It's those cigar-chomping WASP Republicans again. Strolling past the shabby, homeless, urban poor with scarcely a glance. Luckily, our little squirrels don't have to look just yet. Mommy has them safe in her garden and deeply involved in learning how to restructure society by building teetering towers of blocks. Oh, no! Here comes that big, bad, lumbering tusked elephant just stomping down the path looking to crush that shabby, homeless, urban poor guy. Hide! Flee! Oh no! Bad, bad elephant. Hide! Flee! So blind and so.... well... white! Hide! Flee! Can nobody save the little squirrels from becoming just a couple of furry wet spots on the path? Can nobody get enough cash together to buy both squirrels a pair of pants? 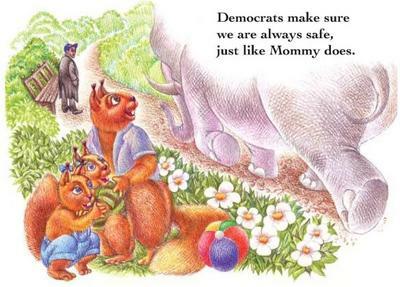 Mommy can do all this and more, because, just like all the real Democrats in real life, mommy spends a lot of time "making sure we are all safe." Zilber on his magnum opus: " Why Mommy is a Democrat brings to life the core values of the Democratic Party in ways that young children will easily understand .... [This book] depicts the Democratic principles of fairness, tolerance, peace, and concern for the well-being of others. It's a great way for parents to gently communicate their commitment to these principles and explain their support for the party." "Jack. Jill. What do you want Daddy to read you tonight while mommy is driving Cindy Sheehan's bus around the country looking for free parking? Good Night Moon?" "No. No. Daddy. Not that. 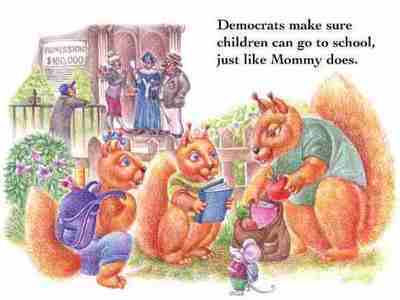 Read us about the nice squirrel mommy and communicate the principles of the Democrats to us. Please, Daddy. Please... please..."
I don't know about you, but if I was Howard Dean I'd have my people checking this Zilber guy out. He could just be this season's Karl Rove mole. Search "Jew" and replace with "Republican" and you've just about got it. UPDATE 2: An interesting observation from "AskMom" in the comments: "Lost in the sticky margins of "Why Mommy is a Democrat" is something almost always missing from these liberal wastewater fantasies...any hint of where "Mommy" gets the money for her gentle, caregiving lifestyle."